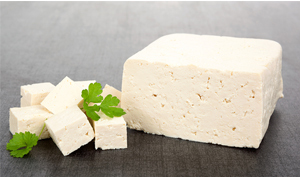 Slice tofu into 1/4 inch thick slices, and dry pieces with a paper towel. One at a time, press tofu slices into crumb mixture, turning to coat all sides. Heat oil in medium skillet over medium heat. Cook tofu slices until crisp on one side. Drizzle with a bit more olive oil, turn, and brown on the other side. Combine tomato sauce, basil, garlic, and remaining oregano. Place a thin layer of sauce in an 8 inch square baking pan. Arrange tofu slices in the pan. Spoon remaining sauce over tofu. Top with shredded mozzarella and remaining 3 tablespoons Parmesan.